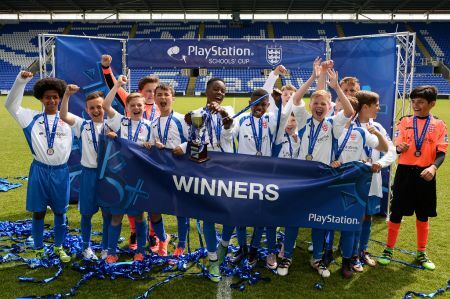 This season’s PlayStation Schools’ Cup Festival was another fantastic success for the ESFA and PlayStation partnership, seeing 15 school teams crowned National Champions across three football-packed days at Reading’s fantastic Madejski Stadium. You can find Monday’s line-up of events below including appearances from Crystal Palace’s Jason Puncheon and England Women’s Captain, Steph Houghton! Day one of the festival started bathed in glorious Berkshire sunshine ahead of crowning the first five National Champions in their respective competitions and an appearance by Crystal Palace Midfielder Jason Puncheon ahead of his appearance in the FA Cup Final the coming weekend. Our first Girls’ final of the week also saw a guest appearance from England Women’s Captain Steph Houghton who presented the teams with their medals and trophy. Whitgift School and Moorland School contested the first game of the Festival which kicked off at 09.30 under the brisk morning sunshine. However despite the early start, there were no cobwebs for the Whitgift team who opened up a 2-0 first half lead through goals from Matt Vigor and striker Fionn Mooney, who had proved prolific on their run to the final. Moorland pulled one back in the second half from the penalty spot before Mooney made it 3-1 and sealed the win. It was the first of two finals for Whitgift whose U13 team would be returning on day 2 in the Under 13 boys’ final. The B Team final, between Thomas Telford and Glyn School, burst into life early on as Glyn took a quick lead. However Thomas Telford roared back and a hat-trick of instinctive finishes from striker Adam Taylor gave them a 3-1 lead. Glyn pulled a goal back late on but they couldn’t force the draw and Thomas Telford prevailed in the first of three finals they would compete in on the opening day. Thomas Telford’s Under 15 team were out shortly after, as they faced Northampton School for Boys in the Under 15 Open Schools’ Cup final. It was not to prove as successful as their first final, as a last-gasp goal from Jamal Robinson sealed a 2-1 win for the Northampton who celebrated wildly at the final whistle. 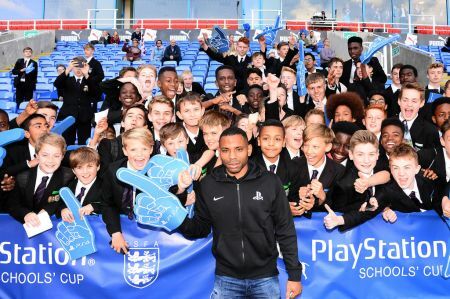 Both teams were also presented with their medals by Crystal Palace midfielder Jason Puncheon, who was supporting the event ahead of his appearance at Wembley on Saturday for the FA Cup final. 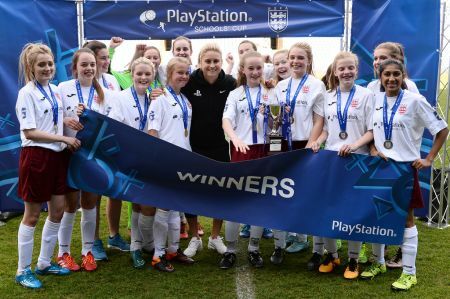 It was time for the girls next as Shenfield High School and Thomas Telford went head-to-head for the Under 15 PlayStation Schools’ Cup for Girls. 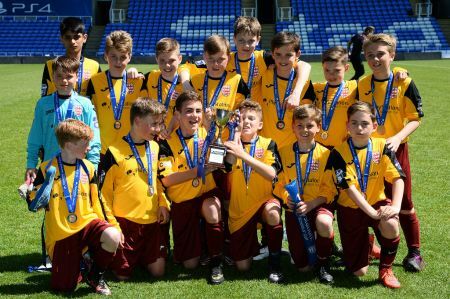 Shenfield flew out of the blocks and took the lead within two minutes, however it was not to be as a goal in each half for Thomas Telford completed the turnaround and ensured they got their hands on their second national trophy of the day. 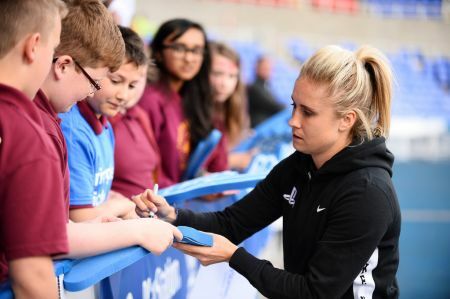 In another surprise guest appearance, England womens’ captain Steph Houghton was on hand to present the medals to both teams, including consolidating a particularly crestfallen member of the defeated Shenfield team with the priceless gift of a pair of boots. 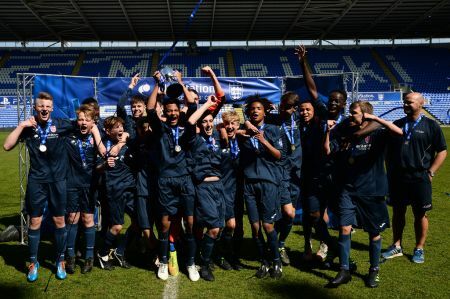 It was a matter of saving the most goals until last, with the Under 15 Small Schools’ Cup producing nine goals in a gripping encounter between Gosford Hill School and Howden School. After racing into a 4-0 lead at half time, Howden roared back early in the second half with two goals reducing the deficit to 4-2. However Gosford were not to be denied with striker Jonah Clarke scoring a hat-trick, including a mesmerising free kick which will surely feature in our Goals of the Festival compilation!